Hello everyone, I am Steph, second year Ancient history and anthropology student. …You may think that I have just made that word up but it’s actually the name of the guy who (presumably) used to live in Fishbourne. First of all, get comfortable. Embrace the Roman custom of reclining on your left elbow and let me tell you about our last trip with the Classics Department. 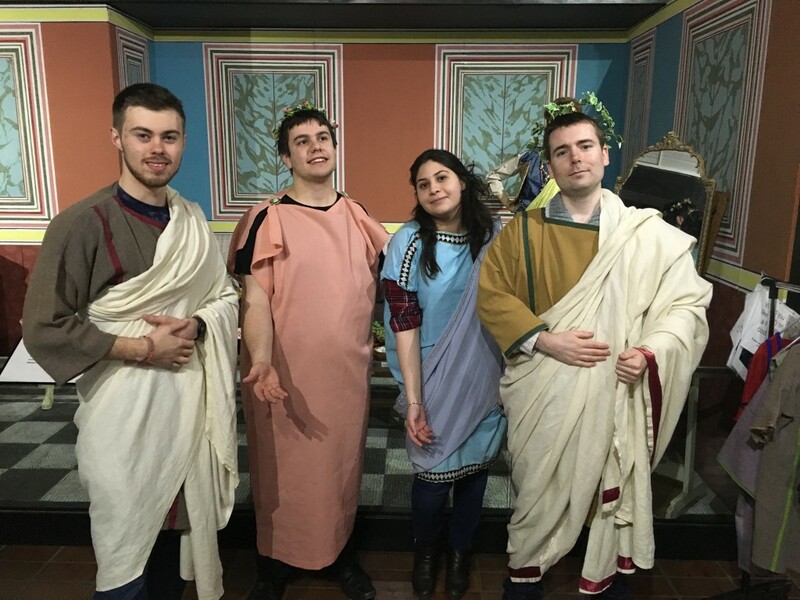 During the weekend of our reading week, a group of students accompanied by Dr. Matthew Cobb got to visit the Roman Palace in the village of Fishbourne, Chichester in West Sussex. We were welcomed to the palace by the customary video were we were kindly encouraged to treat the place as if were our own. And so we did! Reclining for our feast, although the Romans were missing out in the TIC-TAC department. While we strolled through the gardens, we came across a Triclinium and so like true Romans we decided that a feast was in order. 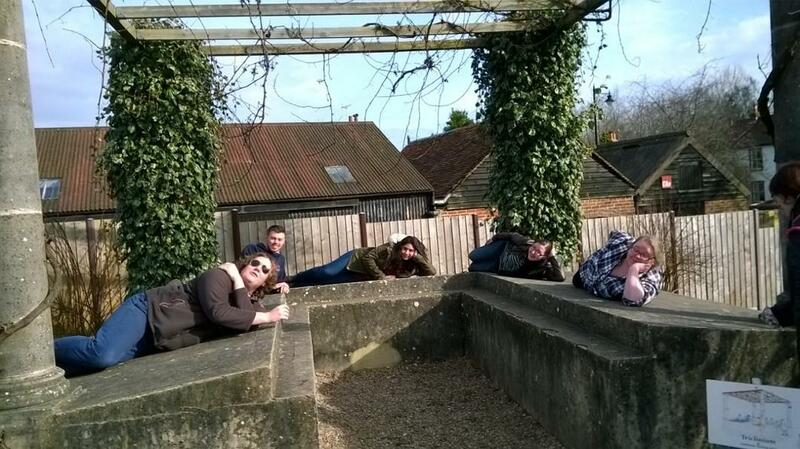 Only we didn’t have any grapes, or wine, or FOOD… but that didn’t stop us from reclining on it and having a makeshift Tic-Tac feast, you have not reclined until you have done so in a Triclinium while sharing Tic-Tacs!!! Moving on from all the reclining (there was a lot of that happening), we were able to see the large collection of mosaics that can be found in the Palace, as well as gemstones, and other findings. 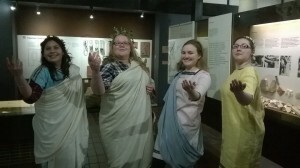 And then, we found some Togas! 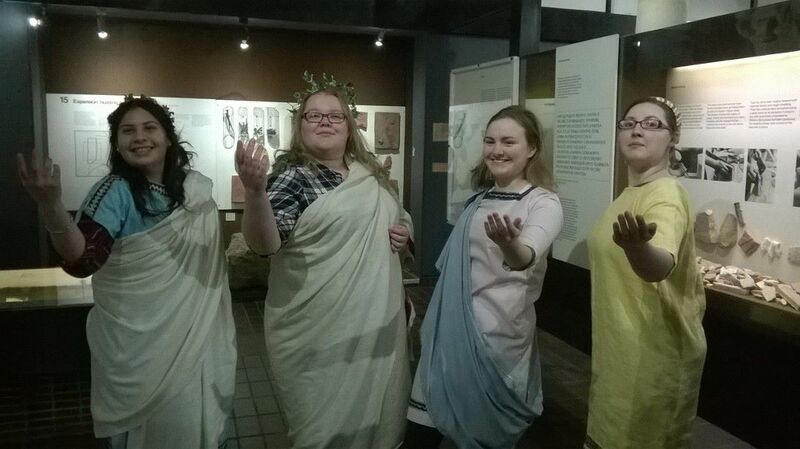 And, well, it was a Classics trip, you cannot expect us, students (and the lecturer) to not get excited at the prospect of having some Toga Time! And truly experience what it would have been like in such a lavish residence. Dressing up as a Roman family, with Dr Matthew Cobb as the pater familias. The Roman dress exhibit was, as you can see, rather popular! Apart from the Roman Palace we also got to visit other places, such as the Novium Museum, which was built above the remains of a Roman public bath house and has a very interesting display of the chronological changes of the Chichester district from Roman to modern days. More dressing up fun took place (however this time there were no togas around). From this museum we konga lined (literally) to the cathedral, where we appreciated the architecture amongst other things. 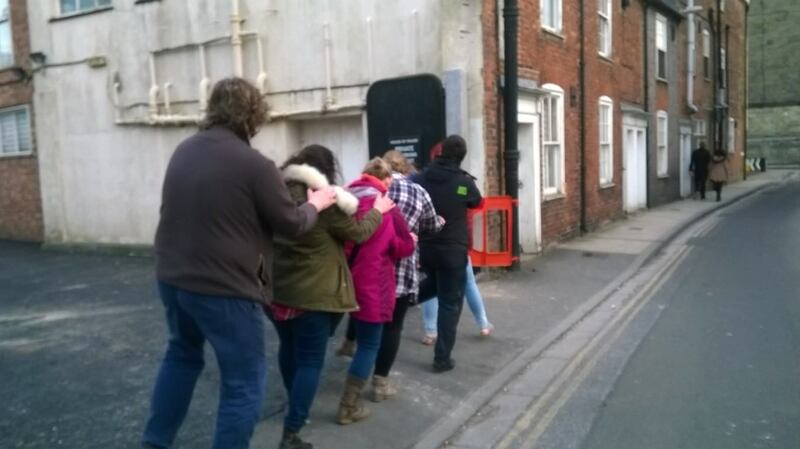 When we say konga line, we mean it! During our second and last day of the trip we had some time to explore the historical town of Arundel before making our last stop at Portchester Castle. Once we arrived at the castle, we were given the opportunity to explore the grounds, and learned about the long history of the site. Portchester Castle is a medieval castle built within the walls of a Roman fort. A major highlight of our visit to this particular castle was climbing the spiral staircase to the rewarding view from the top of the tower and embracing the cold wind while screaming and singing to anyone in earshot. Sadly, this amazing trip had to come to an end, we returned to Lampeter with great memories, and we not only got to learn a bit more about the history of the places we visited but we also enjoyed ourselves to the fullest!